I’ve been doing a lot of shopping at our local farmer’s market. I love all of the fresh vegetables, locally produced meats, freshly baked bread and of course all of the homemade sweets. I always load up on tomatoes but often don’t use them all before they start to get too soft. 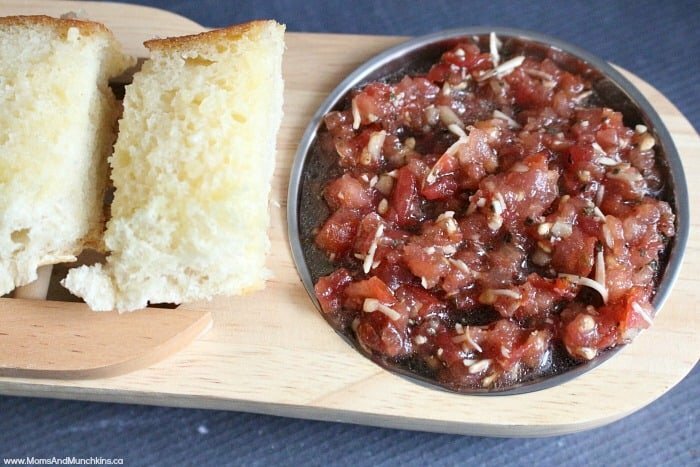 Today I decided to take my extra tomatoes and turn it into a delicious bruschetta. 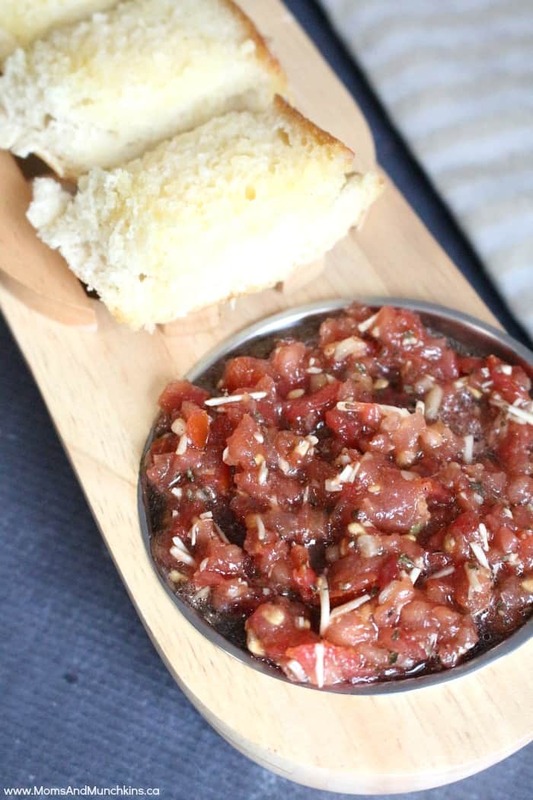 With a little bit of internet research and a little trial and error, I made this delicious easy bruschetta recipe that my family gives two thumbs up. If you are using really juicy tomatoes, I’d highly recommend that you strain them after dicing them. 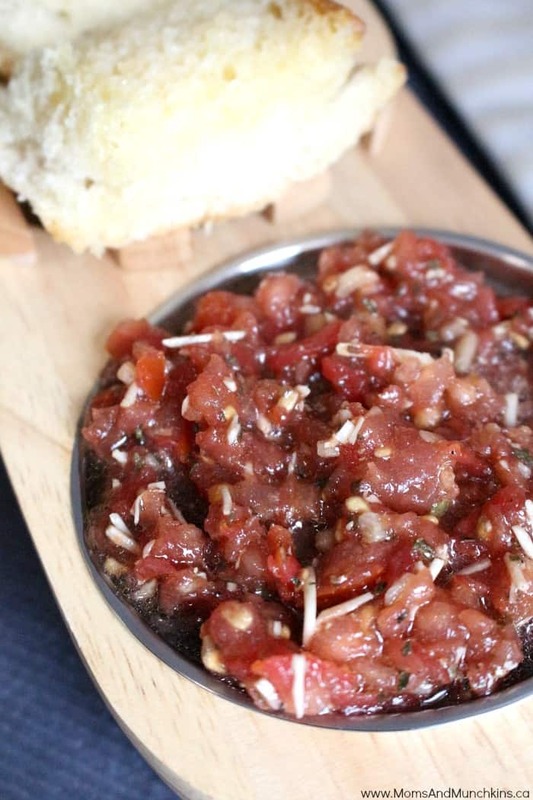 This will help to eliminate some of the extra fluid in the bruschetta and help to prevent sloppy spills. Very easy to make and you can find many of the ingredients at your local farmer's market. Drizzle top of baguette with melted butter and sprinkle with about 1 teaspoon of grated parmesan. Heat in oven just until slightly warm. In a medium mixing bowl, combine garlic, olive oil, balsamic vinegar, cheese, tomatoes, basil, salt and pepper. Stir to mix. Top pieces of sliced baguette with bruschetta. What is your favorite food to buy at the farmer’s market? Do you stock up on fresh vegetables and fruit or do you load up on pies and other treats that you can freeze until the holiday season? Let me know in the comments below. For more delicious recipe ideas, follow along on Facebook, Twitter, Pinterest and Instagram. It looks wonderful! What a great way to start a meal! I’m so glad you enjoyed it, Debbie! It’s such a delicious appetizer and nothing beats fresh baguettes!